Often, once a child can read independently, or he or she can sit though a chapter book, parents (including me) may let picture books sit in the “to read” pile a little too long. I’m a huge advocate of reading picture books to older kids and my (almost) 6 year old is certainly a big fan of colorful illustrations and text he doesn’t have to sound out. This year, I’ve shared a lot of chapter book lists. One of the reasons is that those lists are by far the most popular on the blog. They get shared with other parents with a much higher frequency than my picture book lists. However, you can still find loads of interest specific picture book lists, all listed in the master index. It goes without saying that a 6 year old will enjoy picture books on a different level than a 3 year old. They can read subtext more clearly, understand the humor in irony, and relate to emotional context. (I’m not saying 3 year olds don’t do this, it’s just different!) In some ways, reading picture books to older kids can be even more enjoyable than to toddlers. It’s certainly more intellectual. Brief Thief is a very popular book in our house. Originally published in France, it was one of the boys’ very favorite books of 2013 and it continues to make them laugh out loud. The scenario is so ridiculous but still offers kids insight into the importance of following one’s conscience. I don’t want to give away the hilarious details of the plot, so let’s just say that it involves a chameleon who runs out of toilet paper, a pair of underwear and a superhero rabbit. Does that peak your curiosity? The Three Questions [Based on a story by Leo Tolstoy] . I gave this book to my older son (age 9) for Christmas last year and recently have been reading it with my (almost) 6 year old. I know that as we continue to read it, he will learn to think about the answers to the three questions (What is the best time to do things? Who is the most important one? What is the right thing to do?) in terms of how they apply to his own life, but right now the book is a good foundation for him to reflect on the importance of doing good deeds and paying attention to the immediate moment. Journey and Quest. I know I keep mentioning these two books, but they have been enormous hits with my younger son. Because they are wordless, the “reading” of the story involves both of us. I ask questions, my son narrates the action, and even points out details that I’ve missed. Telling the story repeatedly has increased his understanding of action, character, and story structure, all very important foundations for literacy. The Invisible Boy . Sometimes when I read a book I can hear the wheels turning inside my son’s head as he processes the story. That was the case with this book about a boy who feels invisible, ignored, and left out at school. Then one day a new kid comes to class and a small act of kindness turns things around. It’s a gently told story which teaches empathy and kindness. There are even questions for discussion in the back of the book. Each Kindness. Now a 1st grader, my son is in the thick of things with large groups of peers. The dynamic is something he is working on and I hope that I can raise a boy who thinks about the being kind to others. This story has interested him lately and I first shared it on my list of books about acts of kindness. New girl, Maya, finds herself alone at school. Her obvious poverty sets her apart and the other children reject her overtures of friendship. Another girl, Chloe, narrates the action and the way the other children reject Maya, including her own admission, “She’s not my friend.” One day, their teacher drops a stone into a bowl of water to demonstrate how powerful the ripples from a single act of kindness can be. “Even small things count,” she says. Chloe decides that the next day she will be kind to Maya, but Maya never returns to school and Chloe doesn’t get her chance. This book could so easily sink into the depressing and didactic, but Woodson’s beautiful text elevates the story into a moving reminder to show kindness every chance we get. The Way to the Zoo. John Burningham’s books have a classic feel to them. In this tale, a girl discovers that her door opens into a secret passageway that leads to the zoo. She secretly brings various zoo animals back to her room, where they create chaos and fun, but the girl shows she has everything under control. A good, old-fashioned story that my son loved. The Adventures of Beekle: The Unimaginary Friend. When my kids were younger I always felt that picture books which relied on magical realism flew over the the heads of my boys. He would not have understood this book at all when he was 3. That is no longer true. Neither of my kids ever had imaginary friends and the concept was entirely new to my son, but he was fascinated by this story about how an imaginary friend leaves his imaginary world to find the child he is supposed to be matched with. I was intrigued by how my son had to figure out how the world in this book actually worked! 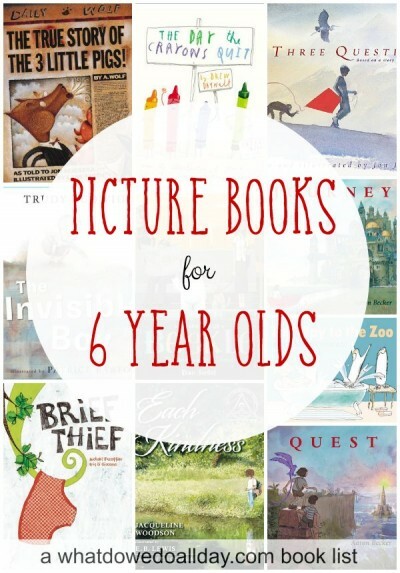 What picture books do your older kids still enjoy? Are you still reading picture books to them? I am hopelessly addicted to your blog. I watch for the booklists (never a bad time to find new interesting books to share), but I love your other posts as well. ‘Just a little peek into the interactions of another mom and her kiddos. THANKS! Thank you, Elizabeth. Your comment put a big smile on my face this morning! Awesome list! Some of our favorites are here (like The Day the Crayons Quit) but some new titles as well! We just read Where’s Mommy and the illustrations are to die for! And don’t tell anyone, but when I am reading picture books to my 8 year old who still adores them, my 11 old tends to make an appearance. 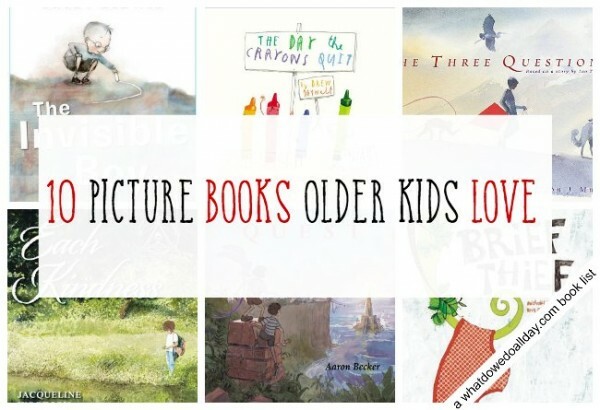 You are never too old for picture books! My almost 10 year old does the same thing, but he also always wants to read them independently, which I love. I have become a huge fan of your book lists in the past few months, as my library hold list shows, but I want to share my favorites. And for chapter books have you checked out Lloyd Alexander? As an adult when I heard he had passed away, I called up my sister and we both cried. The Prydain chronicles are funny, scary and absolutely wonderful. My mother, an theater major, did a great Gurgi voice. Thank you, Carrie! I also love The Maggie B. I remember it from my childhood and so I had to buy it for my own kids, too!. I’ve never read The Little Moon Theater and I will definitely have to look for that one! I’ve seen Alexander’s books on the library shelf and I keep telling myself I need to read them, I think you just gave me the motivation! The books of David Wiesner, like Flotsam, Mr. Wuffles, and Tuesday are all amazing, beautifully illustrated wordless picture books in the vein of Journey and Quest. You can read them over and over again and pick up different details of the story each time! Yes, we loved David Wiesner, especially Tuesday and Sector 7!!! Have you ever come across Sean Tan? I’m not sure how widely he’s known over there, if at all, (he’s Australian). Look him up, I think you’d like his work. The Red Tree, The Rabbits and The Arrival are favourites. All a little dark, but thought provoking and the artwork is mind-blowing. We also really like The Grey Boy, by Farre and Gusti, and anything by Graham Base, Mo Willems (such great early readers! ), and Lauren Child. I really like Sean Tan, although I thought his book Rules of Summer was really weird! The Arrival is a gorgeous book, though.